Pine County, so named due to the abundance of pine trees all throughout the area, has its vital statistics department with the County Recorder. Birth, death, and marriage records from 1871 to the present, along with military discharge records are indexed and stored at the Recorder's office, and all are available for research with the exception of military discharge records and certified birth certificates, which are restricted to those who can prove a tangible interest. Noncertified birth records are included in the public record, although copies that aren't certified cannot be used in any legal sense. 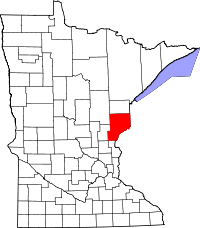 The Pine County Genealogical Society, which in headquartered in Sandstone, MN., lists a variety of research resources on its website, as well as providing directions to other genealogy sites. Comprehensive databases of cemetery records and obituaries are also listed on its website and are open to the public and free to use.